Kirkintilloch Rob Roy kickstarted their season in spectacular style with a thumping 9-1 Scottish Junior Cup win. 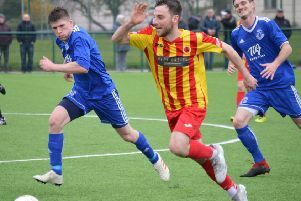 Stewart Maxwell’s side stormed into the third round in emphatic style after a stunning second half performance against 10-man Irvine Victoria. The visitors started on the front foot and a long throw-in from John Sweeney was headed on by Willie Sawyers into the path of Gavin Mackie but his shot went narrowly past from the edge of the box. Rabs passed up a good chance when Sawyers set up Connor Hughes, but he failed to make proper contact and home keeper Ryan McLaren collected the ball easily. Michael Daly’s header then scraped the Vics post before going wide, but Rabs took the lead a minute later when Martin McBride’s cross fell to Scott Walker in the box and he blasted the ball low past Ryan McLaren. Matters became worse for the Ayrshire side in the 16th minute when they were reduced to 10 men, Ross Loughlin red carded for a reckless tackle on Mackie. Minutes later Daly’s pinpoint cross was headed over the bar by Hughes from a few yards out as the Roy looked to take advantage. The Roy’s keeper John Hutchison had to make a brilliant diving save to push Ross McKenzie’s free-kick wide of the post before the visitors extended their lead on the half hour. The impressive Cameron Clark crossed for Mackie to make no mistake. Hughes had the ball in the Vics net shortly after but was flagged offside and with play becoming scrappy real chances were becoming scarce. But on the stroke of half-time, and against the run of play, the home side pulled a goal back when Ryan Morrow was left unmarked at the back post to slot past Hutchison. But it took Rabs only three second half minutes to restore their two-goal advantage, McBride blasting a Vezza cross past McLaren. Vics kept plugging away but the visitors who extended their lead in the 52nd minute when Vezza headed in a Sawyers cross. The home side should have pulled a goal back with McKenzie’s effort going wide before the Roy scored again in the 56th minute when Sawyers cleverly beat his man at the back post to slot past McLaren. Ten minutes later the Roy made it six as Clark’s cross found Hughes in the box and he turned well to shoot home, resulting in the home support making their way to the exit. It was now one-way traffic and Vezza latched onto a through ball to cleverly lob the ball over the onrushing McLaren and make it seven. Ryan Morrow kept Hutchison on his toes with an effort from distance before, in the 73rd minute, Vezza’s trickery set up Clark to chip in number eight. Two minutes later Sawyers shot against the base of the post, but the ninth goal came in the final minute as new signing Michael Tuohy celebrated his debut by driving home a low left foot shot beyond McLaren. Sponsor Jimmy Dunn presented the Supporters’ Man of the Match trophy, kindly donated by Roddy the Dog Walker, to Alberto Vezza.